We are proud to introduce our brand new line of boutique instrument cables, created by musicians for musicians. 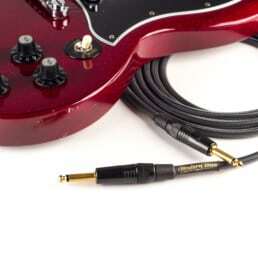 Each ModernTone instrument cable is meticulously crafted to deliver superior tone and extreme durability. We designed these cables for our own studio and were so blown away by the result, we decided to share it with the world. We start things off with the world-renowned Mogami 2524, used by professional musicians and top engineers everywhere. We then add industry standard Rean/Neutrik connectors, extra rugged protective cable sleeving, and our unique strain-relief and protection assembly techniques. The result is an amazing sounding cable that is built to last. Handmade in Berkeley, California, each ModernTone cable ships with a lifetime warranty card, an awesome sticker and a bunch of free guitar picks. Tone is everything! Don’t ruin yours by using bad cables. ModernTone instrument cables are designed by musicians for professional use in both stage and studio applications. Handmade using top-shelf components, these cables deliver pristine sonic clarity, exceptional durability, and a modern slick look. We use some of the finest cables, connectors, and materials available and follow very strict assembly standards. When it comes to durability, we go the extra mile at every juncture, using multiple techniques and methods to ensure your instrument cable can handle the abuse of everyday use. Each of our high-end cables can be equipped with a Silent Plug that eliminates amp pops when unplugging your instrument. The Silent Plug senses when it is not plugged in all the way and immediately cuts the signal. It’s ideal for switching guitars on stage, auditioning different instruments in the studio, and pretty much any scenario that involves an instrument and an amp. The Mogami 2524 is one of the most transparent sounding cables available. It features a 20 AWG center conductor, oxygen-free copper core and polyethylene insulation. The 2524 also includes a conductive PVC layer that drains away minute voltage generated when a cable is flexed or stepped on, making it extremely resistant to microphonic noise. It measures 130pF in capacitance and comes in a 6mm / 0.236″ sleeve for a perfect balance between flexibility and durability.